The Vice-Busting Diet: A 12-Week Plan to Break Your Worst Food Habits and Change Your Life Forever was created by Julia Havey, who lost 130 pounds and has kept it off for over ten years. Havey says that the key to losing weight and getting healthy is to recognize and eradicate the vices that are getting in your way. In this book she offers strategies that will help you to eliminate these vices and replace them with healthy alternatives. 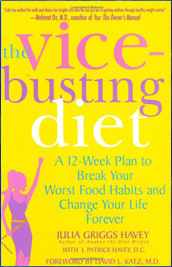 The Vice Busting Diet can be followed by reading the book or signing up for the online program. According to Havey this plan is not just another diet but rather is about changing your life in a way you haven’t tried before. Havey says that dieting asks you to make an overwhelming total change so she takes the approach of making small changes, one day at a time. The first 21 days of the program concentrate on breaking your worst food habit forever – the one that you know is the main cause of your inability to lose weight. For each day there is a morning and evening affirmation as well as specific activities that you are instructed to perform. The activities may include answering questions, setting goals, carrying a water bottle, finding healthy substitutes for your biggest vice, starting exercise and setting up a reward system to celebrate your achievements. Following this the rest of The Vice Busting Diet concentrates on providing education about how to create a healthy lifestyle that will enable dieters to lose weight and keep it off. The book includes a 12-week plan and the online program is for 26 weeks. Fruit, vegetables, oats, whole-wheat pasta, protein shakes, skim milk, egg whites, flaxseed oil, chicken breast, salmon, tuna, fat-free popcorn, rice cakes, low-fat cottage cheese, beef tenderloin, scallops, brown rice, sugar-free jam, split peas, black beans. Exercise is gradually introduced during the first 21 days of the Vice Busting Diet. Whenever dieters reach a weight loss plateau they are advised to increase the intensity and duration of their fitness regime. A regular schedule of cardiovascular exercise and muscle strengthening exercises is encouraged and basic programs are outlined for a range of fitness levels. The Vice-Busting Diet: A 12-Week Plan to Break Your Worst Food Habits and Change Your Life Forever retails at $23.95. The program is also available for free online and includes a large variety of resources. Concentrates on making permanent lifestyle changes. Encourages a regular exercise schedule. Involves journaling, which is associated with a greater chance of successful weight loss. Some dieters may resist giving up their bad food habits completely. Completing all of the daily activities will require some degree of time commitment. Some dieters may find that drinking large amounts of water at each meal impairs digestion.